Anthony is one of the new smiling faces to greet you at Lively Physiotherapy. Having previously studied in a dynamic field like marketing has helped Anthony identify each client’s needs and addresses them in the most effective way possible. Exploring new areas, especially in the natural world, both inspires and relaxes Anthony. He finds bush-walking to be a soothing counter-balance to a busy work schedule. Anthony particularly is interested in the way a small business operates and enjoys being one of Lively’s friendly faces. 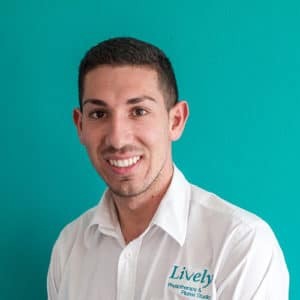 Anthony is also keen to ensure the overall experience at Lively is a positive one and is on hand to help out in any way he can to look after our clients.